I'm participating in the Conscious Me Pre-Writing Challenge. Learn more. This year, I participated in the first annual Conscious Me Pre-Writing Challenge. Not only did I participate…I won it. If you have no idea what I’m talking about, check out my detailed description of the challenge and its rules. If you’ve already read through one of my weekly posts on the topic you can skip down to the bottom to get my description of week 4 and my endnotes. In this article I’m rewriting (and significantly trimming down) the whole experience in light of my successful conclusion. Anyway, this challenge is all about Writing it Early, which I talked about at the start of the challenge. That’s something you need to work on, whether you’re a blogger, a novelist, or anyone else who has to do serious writing from time to time. It always feels like a hassle, a necessary evil — or maybe you see it as a luxury you can’t afford — but it’s one of the best things you can do to make your work better (and, ultimately, to make it easier and less stressful). That’s a big claim, and one that needs backing up. 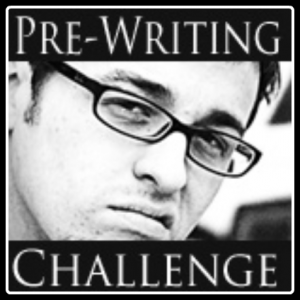 Lucky for me, my experience with the Pre-Writing Challenge provides some excellent evidence. I started Unstressed Syllables last December with a heaping tablespoon of ambition and a pinch of planning. My first three articles were my mission statement, my site design, and my about page. I wrote them on the fly, settled into a schedule, and got to work writing down all the writing advice I’d been sharing with friends and family for years. I’m a professional writer. It’s what I do. So putting ideas on paper was never a struggle for me, and that initial burst of energy was worth at least a month of blog posts. Maybe six weeks. By the end of January, though, I was starting to run low on energy and ideas. I was finishing up my posts later and later. I was looking with longing on the list of all my other projects that I’d put on hold. Edging into February, I found myself barely finishing posts before their deadlines, staying up late nights just so I could claim I’d published on “Tuesday” (because 11:59 counts). I’d have to spend the whole next day cleaning up the mistakes I’d made, and hoping my readers hadn’t seen it yet (how sad is that?). It was exhausting and it was stressful. Every post was work. Then Carlos came around with his big idea, suggesting what started out as an accountability agreement and blossomed into the Pre-Writing Challenge. Just as I was at the point of hating every minute I spent writing for my blog, Carlos suggested I commit to spending a whole lot more minutes. I scoffed at the thought of it, especially with a four-day weekend out-of-state looming over me, and some serious overtime at work for the next month or two. Carlos asked me directly for my help, though. Even then, I only agreed to it because Carlos and I are friends, we got into this blogging business together, and I felt like I owed him. I figured there was a 50/50 chance it would ruin our friendship. It didn’t. It revived my blog. I got back from my trip five days before the official kickoff of the month-long challenge. When he was making up the rules, Carlos had scheduled a little bit of prep time to get ready, mainly so we could get some promotional and explanatory material up on our sites, but we all intended to use that time to get a small head start, too. For me, that mostly just meant getting caught up. I got home on a Monday night, with a post due (and totally unwritten) for that day, and another (also unwritten) for the next, and two more due before the end of the week. Not only that, but as one of the requirements of the challenge, I needed to get a challenge page written that described my goals for the project (meaning the specific two weeks’ worth of articles I wanted to get written). I was nowhere near that organized. I had to be, though. I dashed off a writing exercise to meet my requirement for Monday, stayed up late writing the next day’s article, and then spent all day at work Tuesday thinking about how I could possibly manage the Challenge. The answer I came up with was a spreadsheet in Google Docs — a blog posting schedule with columns representing days of the week, and rows representing the six weeks of the challenge. That changed everything. In one night I went from scoffing at the challenge, seeing it as an arduous sacrifice I would struggle through for a friend, to genuine optimism. Several of the articles I’d dreamed up just to fill out the spreadsheet had me anxious to get started, then and there, and for the first time in weeks I found myself excited about writing for the blog. I spent the rest of the week getting ready, and that excitement only grew. The Challenge itself was 30 days of writing, four weeks to write six weeks’ worth of material. My first priority was just to get back into a regular writing schedule, to get back to writing my regular blog posts at least a day before their deadlines. The spreadsheet helped with that (and, of course, the forethought that went with it). Within the first week I was back on schedule. Week 2 featured a post that required some feedback from an expert source (which meant a fairly slow email exchange), but I tackled that as one of my early pre-writing posts, so I had it done with plenty of time for feedback and correction. Because I gave myself that time, the article went live looking just the way I wanted it to. That success alone repaid all the effort I’d put into the challenge so far. By the end of week 2, I was two weeks ahead, but I’d also used up most of the ideas I’d been thinking about for months. Now I was into new territory, working on topics I’d just made up to fill out my spreadsheet. I also started running into problems with scheduling. When I came up with an outstanding idea for a new post (and one that would need to be published quickly), I had to bump my carefully structured schedule, and just as I got that settled, another change came along. Week 3, I learned the very important skill of rearranging a posting schedule — keeping it strong, but flexible. In week 4, all I had to do was get it done. Any novelist will tell you that can be an agonizing challenge, though. The closer you get to the end, the more resistance you find. There are so many details that have to be sorted out, so many promises that have to be fulfilled, and that constant nagging suspicion that you haven’t quite done enough. You get that in the last week of the Challenge, but it’s an experience I’m familiar with, and three years of participating in National Novel Writing Month have taught me how to just get it done. So I did. Wednesday afternoon, with an incredibly busy weekend of Real Life stuff looming, I typed up a handwritten post, polished some of the rough edges off a draft I’d written a week ago, slapped some illustrations around willy-nilly, and called it done. I popped into Twitter to brag about it to everyone I knew. That sense of victory was real. And it lingered. Thursday morning, swamped with a To Do list a mile long, it suddenly hit me that I didn’t need to worry about my blog. I wasn’t getting behind. I hadn’t forgotten to review the day’s post before it went live. Everything was fine. That’s a deep and powerful sense of comfort, for the blogger. It sneaks up on you, and I still find myself panicking from time to time. Sometimes I get all the way to my WordPress Dashboard before I remember. Everything is fine. There’s more than that. Everything is better. I’m confident every post I wrote this month was better than the ones I was writing (frantic, frustrated, and fearful) in those first hectic weeks of February. I’ve spent more time thinking about them, more time reviewing them, more time linking up internal references and picking perfect pictures for illustration. The Challenge was a real commitment, and a lot of work, but the reward is a better blog, top to bottom, and a better experience blogging to boot. I can’t overstate that last point, either. Everything is easier, and everything is more fun. These days, when I have some time to write, I look over the three or four weeks of topics I’ve already got in my spreadsheet and pick the one that sounds most fun. There’s nothing I have to get written. I write for fun, and there’s room for error. There’s room to scrap an idea that just didn’t turn out, without ruining my week. I can put my focus where it needs to be: on doing what I do well, and helping the people I want to help. That’s fun. That’s the benefit of the challenge. That’s the benefit of writing it early, made real. Make the time, get it done, and feel some of that victory for yourself. It’s so worth the effort. This was written by Aaron Pogue. Posted on Sunday, March 21, 2010, at 6:50 am. Filed under Uncategorized. Tagged Blog Challenges, Blogging, Drafts, Editing, Feedback, Unstressed Syllables. Bookmark the permalink. Follow comments here with the RSS feed. Both comments and trackbacks are currently closed. Awesome! Glad you participated. It’s a lot of work and totally intimidating to me. I’m super impressed. Hey, thanks for all your support, babe! I couldn’t have done it without your patience (especially when I needed some confidence). We’ll get your schedule done (I’m dedicating a blog post how-to to the topic next week), and that will go miles toward helping you find your pace. After that, all you have to do is write about things that interest you, and if yesterday’s post is any indication, it will all be fantastic. Thanks. I am proud of that one.